When you are facing an insurmountable level of personal debt, bankruptcy can be the way out. 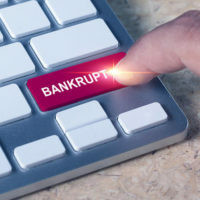 Although bankruptcy is not a legal process to take lightly, it is one to seriously consider if you feel like you cannot take control of your debt through other means. You can make the bankruptcy process easier for yourself by taking the time to educate yourself about all that the process entails. Use what you learn to prepare for your bankruptcy before you file. By taking the following steps before you file for Chapter 7 or Chapter 13 bankruptcy, you can make the process less stressful for yourself. By law, you are required to receive credit counseling from an accredited credit counseling agency before you can move forward with your bankruptcy case. The United States Trustee Program, part of the United States Department of Justice, maintains a list of accredited agencies by region on its website. If you owe money to a bank where you have a savings or checking account, money from the savings or checking account when you filed for bankruptcy can be used to pay off any debt you had when you filed. This is known as a set off. In a similar vein, money in a security deposit with your utility companies can be used this way. Move your money out of these accounts before you file for bankruptcy to avoid set offs. Do not give away substantial pieces of property without telling your lawyer. When you file for bankruptcy, your trustee examines all property transfers you made in the recent past to determine if any were “fraudulent transfers.” The court can require you to undo any fraudulent transfers and even reject your case if you are found to have made numerous transfers in order to avoid losing the assets in your bankruptcy case. If you accrue a substantial amount of unnecessary debt prior to filing for bankruptcy, you can compromise your case’s chance of being accepted. This is because the court may view your new debt as an attempt to “get in one last vacation” or otherwise spend money irresponsibly knowing that you will not have to pay it back. Spend only money that you have to spend, like buying groceries and paying your utility bills. If you are stressed about your impending bankruptcy, relax. Yes, filing for bankruptcy is a big deal and yes, it will change your life. But if you are facing a level of personal debt that prevents you from having any control over your finances, it is the right choice to make. Work with an experienced Orlando bankruptcy lawyer who can break the process down for you and help you understand what you will face in the coming months. Contact our team at the office of Goodblatt · Leo today to set up your initial consultation with us, during which we can discuss your concerns and answer your questions.